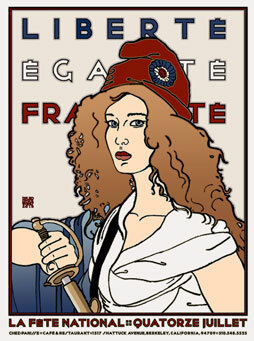 (245) La Fête National: Edition of 1036 of which 125 copies are signed 1-125, 27 copies are signed A-Zz as artist's proofs. Ten dedication copies. Model: Claire Nicole Stremple as "Marianne" the personification of Liberty and Reason, and the embodiment of the French Republic. Social change does not occur gradually. Hidden pressures build, subtle cracks appear, a vague unease disturbs the slumbers of smug elite and bohemian malcontent alike, for the same reasons but toward different ends. Other events, seemingly unrelated, contribute in ways that are only evident much later: communications improve dramatically; the nature of work alters; men and women see one another through different eyes. A few outliers surface and are harshly repressed. The elastic nature of society stretches until one morning, seemingly just like all the other mornings that came before it, something snaps. The Bastille is stormed; market women towing cannon march on Versailles. The Ancien Régime, thought immortal, is swept away in a torrent of violence and death. King George loses a colony; King Louis loses his head. The aristocracy ceases to exist. Europe trembles. Everything changes. A new dawn is breaking.